If a communication from one of the world’s leading national or international companies comes through your door there’s every chance that Tico Mail Works are the company who delivered it. That’s because with over 30 years experience, Tico Mail Works are the trusted mailing house for global companies including Diageo, AIB, Hewlett Packard, Vodafone and many more. With an operation model developed around strict procedures and ensuring ‘visible accountability’ Tico Mail Works reputation for quality has always been central to their service and thinking. So it’s little wonder that ISO Accreditation was high on their agenda. 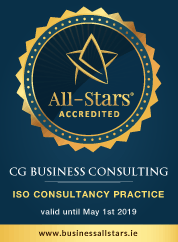 There you have it – CG Business Consulting delivering ISO Accreditation for Tico Mail Works as professionally and successfully as they deliver for their clients.